Lead Generation is undeniably one of the most important activities that help us grow our business. Customer Journey Analytics on the other hand is one of the most important activities that help us understand how our customers interact and engage with us, and thereby help us identify ways to keep our existing customers happy. Naturally then, applying the concepts of journey analytics on leads should help us understand how our leads interact and engage with us, and thereby help us improve our overall lead generation process. Marketers need to treat leads just as customers; more importantly as 'people'. Often, lead generation tends to be cut throat dry task of collecting leads via some sort of inbound or outbound activity, and then bombarding leads with information and trying to get the dialogue going. This is amplified further by marketing automation. Sadly most of the marketing automation out there is really nothing more than lead nurturing automation. Instead, marketers need to apply the concepts of journey analytics on leads, and try to make that journey as smooth and simple as possible. This means focusing less on automating processes that don't work as efficiently anyway, and focusing more on finding ways to provide the best experience to the lead at every interaction point, progressively collecting data in order to learn more about the lead, and providing unique, relevant experience so that the lead feels welcomed and comfortable. Not all people who we recognize as leads would ever convert into customers unless if we are the only business serving a very niche segment. There are a lot more things in play that may make them choose our competitor. However by understanding, analyzing and optimizing their interaction and behaviors with us, even when they are not our customers, we can continue to keep a healthy and unforgettable relationship, which will eventually persuade them to become customers. Therefore, applying journey analytics on lead life cycle is even more crucial. Lastly customer journey analytics, as the name tells, is more about understanding our customers (or in this case, leads) and less about our own internal processes. This is a very important point because most of the traditional analytics and reporting mechanisms in the world of lead generation really focus on our internal processes and less on the leads itself. For instance the classic sales funnel doesn't tell anything about the journey and experience but instead it merely focuses on how many leads are at what stage. It simply acts as a scale to measure effectiveness of our sales force, and gives near zero information about why the funnel is the way it is. 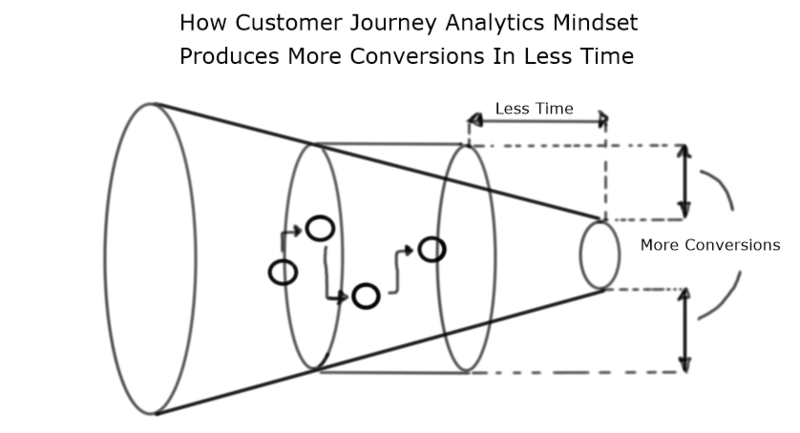 By applying customer journey analytics mindset we can get better clarity into why our funnels look the way they do. We can focus more on the experiences, and improve results from our lead generation methods.